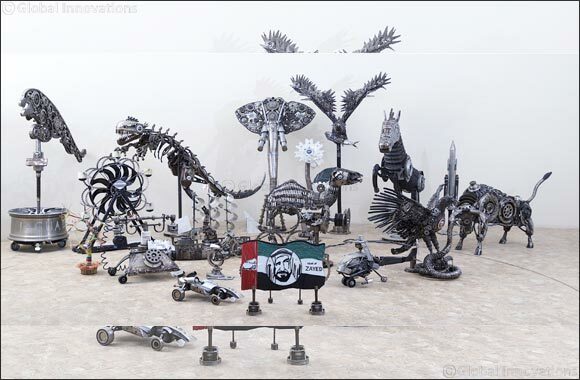 Dubai, UAE, September 10, 2018: Al Tayer Motors, one of the UAE’s premier automobile dealerships representing Ford, Lincoln, Jaguar, Land Rover, Maserati, Ferrari and Ford Trucks, is staging a unique exhibit of some truly stunning works of art made by recycling discarded automobile parts and scrap material. Titled ‘Unseen Potential’, the display is the result of an internal competition organised for the technicians of Al Tayer Motors and Premier Motors. The exhibition will be held from September 14 – 22 and the outcomes of the exhibition will support UAE- approved charitable causes. The art objects will be on display at the dealership’s Sheikh Zayed Road showroom in Dubai and is open to everyone, especially art lovers and automotive enthusiasts. Visitors can even place bids for their favourite pieces – a new feature added in response to strong interest from customers to buy many works of art created for the previous competition. More than 350 technicians from 11 locations across the UAE participated in the two-month long contest designed to enhance their teamwork and highlight their artistic abilities. Together they created nearly 90 art objects from seemingly unusable material using their imagination to tap into the unseen potential in the waste. Working during their spare time, the teams of technicians fashioned some spectacular creations such as animal figures, vehicles, insects, flowers, birds, musical instruments, robots, and more.